Bacon. Need I really say more? 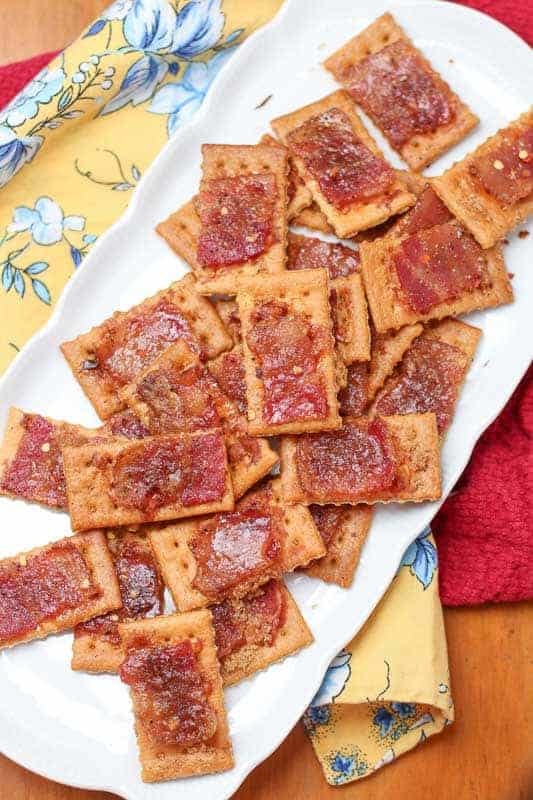 This salty, slightly spicy, sweet, and easy bacon cracker recipe will be the next go-to recipe for all of your parties. Everyone loves this naughty little indulgence. They are so good everyone will leave asking for the recipe. I knew this recipe would be a hit for the men. What man doesn’t like bacon? Add in the crunch and I have won them over. 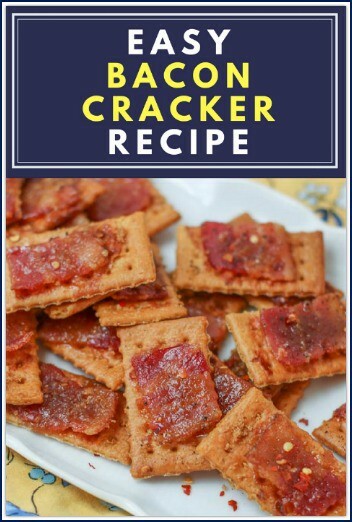 That is why these bacon crackers make a great tailgate food for your football parties. What I was surprised by was how many women love this recipe. I made a batch for my sweet Garden Club ladies when I was co-hosting one of our meetings. I was responsible for the food; big surprise right? They don’t eat much typically, so I thought I would be stuck with a bunch of leftovers. Those little women ate everyone of those crackers. They loved them. I was asked repeatedly for the recipe. I was so pleased. My recipe uses less sugar than some of the other Bacon Cracker recipes. 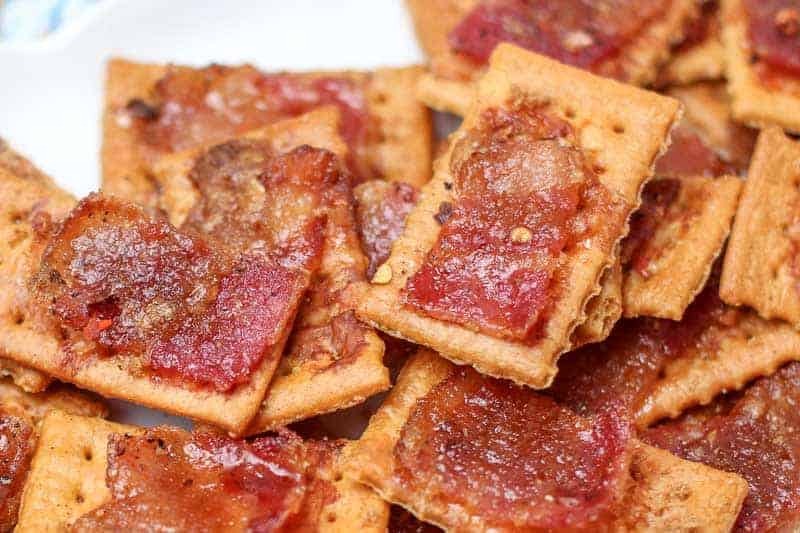 These bacon crackers are perfectly sweet, so I honestly don’t know why you would want to use more. I also add in a little red chili flakes for heat. You know me… I like my food spicy. But if you are a softy and don’t like spicy things, you can omit the red chili flakes. The key to successfully making these is to line a baking sheet with parchment paper or tinfoil.
) on the baking dish and then align the crackers on top. If you do not use the rack, you will burn your crackers by the time the bacon is cooked. The parchment paper or tin foil helps with the mess and clean up. This baking pan below has the perfect fitted set if you need baking dish and wire rack set. If you like this recipe, check out: Fire and Ice Pickles, Easy Spicy Taco Dip, and Juicy Oven Baked Burger Sliders. Bacon. Need I really say more? This crunchy, salty, sweet, & easy bacon cracker recipe will be the next go-to recipe for all of your parties. Align crackers on a wire rack set into a baking sheet lined with parchment paper or foil. Cut bacon into thirds or fourths depending on the length of your cracker and the bacon. Place a piece of bacon in the center of each cracker length wise. Sprinkle enough brown sugar on each slice of bacon to completely cover the bacon. (This will caramelize and stick the bacon to the cracker. 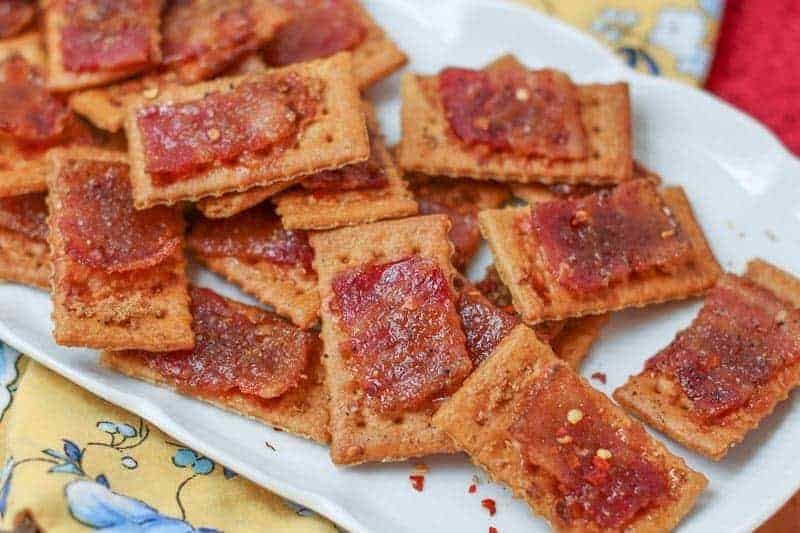 If you like a bit of heat with your sweet, sprinkle a small amount of red pepper chili flakes and pepper on each cracker. Bake15 to 20 minutes or until brown sugar is melted and bacon is crisp. Allow crackers to cool before serving. I would store them in an airtight container the night before. I have always done them the day of and never have had left overs… so I assume they will be fine. However if you put them in the refrigerator, the crackers will soften and they won’t be as good at all. When making these the day before, dobyou store them in the fridge or room temp? I cooked mine more in the middle of the oven. I hope you like them! I have a potluck tomorrow and I want to give these a try! Do you suggest the baking sheet being close to the bottom of the oven or more in the middle? You can make them ahead of time and they are still good the next day. I honestly don’t know how they keep after 24 hours…. They have never lasted that long in my household. These look so yummy! Can I make them ahead of time? Will they keep in a sealed container? These look so totally addictive! I love this – pinning for later. Love the spicy, sweet, and savory bacon combination! Looks really great and super simple. I can totally see why they could get addictive! I am so with you on not using as much sugar as other peeps! 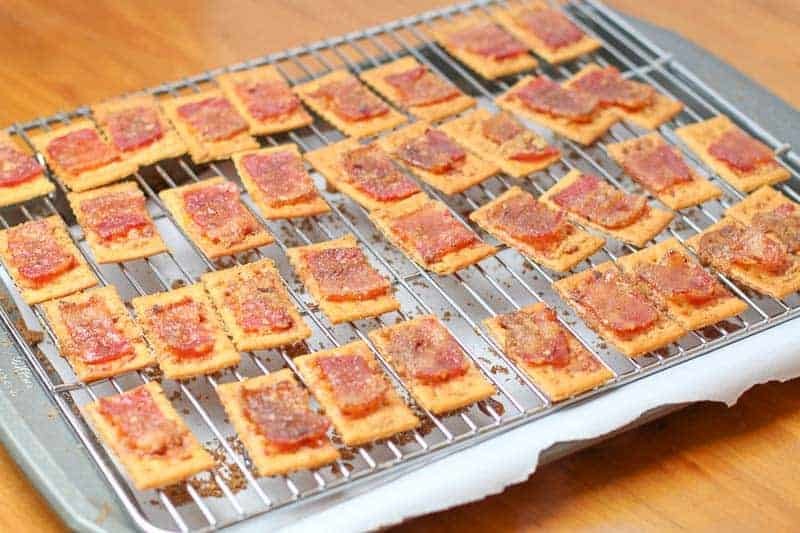 These bacon crackers look yummy. Perfect for an appetizer at my next dinner party! Bacon on a cracker with brown sugar and a little spiciness? I’ll take the whole tray! YUMMMMMMMY! !